I believe I understand how the linux x86-64 ABI uses registers and stack to pass parameters to a function (cf. previous ABI discussion). What I'm confused about is if/what registers are expected to be preserved across a function call. That is, what registers are guarenteed not to get clobbered? 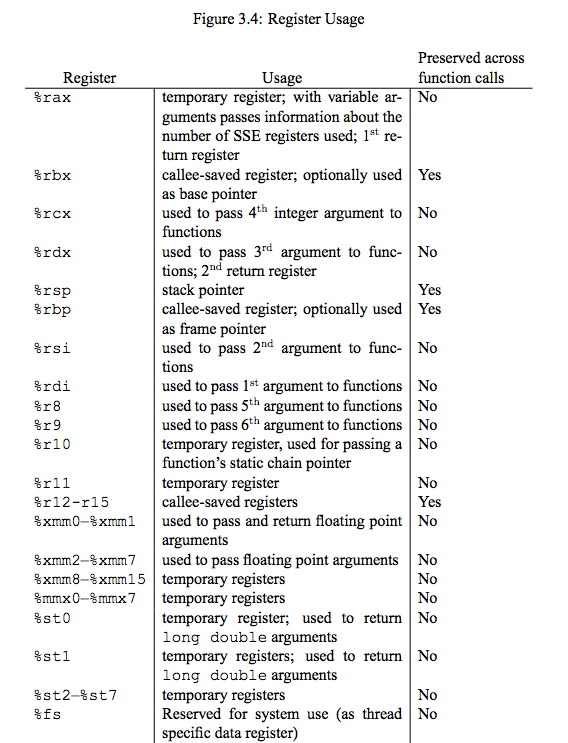 r12, r13, r14, r15, rbx, rsp, rbp are the callee-saved registers - they have a "Yes" in the "Preserved across function calls" column. The ABI specifies what a piece of standard-conforming software is allowed to expect. It is written primarily for authors of compilers, linkers and other language processing software. These authors want their compiler to produce code that will work properly with code that is compiled by the same (or a different) compiler. They all have to agree to a set of rules: how are formal arguments to functions passed from caller to callee, how are function return values passed back from callee to caller, which registers are preserved/scratch/undefined across the call boundary, and so on. For example, one rule states that the generated assembly code for a function must save the value of a preserved register before changing the value, and that the code must restore the saved value before returning to its caller. For a scratch register, the generated code is not required to save and restore the register value; it can do so if it wants, but standard-conforming software is not allowed to depend upon this behavior (if it does it is not standard-conforming software). If you are writing assembly code, you are responsible for playing by these same rules (you are playing the role of the compiler). That is, if your code changes a callee-preserved register, you are responsible for inserting instructions that save and restore the original register value. If your assembly code calls an external function, your code must pass arguments in the standard-conforming way, and it can depend upon the fact that, when the callee returns, preserved register values are in fact preserved. The rules define how standards-conforming software can get along. However, it is perfectly legal to write (or generate) code that does not play by these rules! Compilers do this all the time, because they know that the rules don't need to be followed under certain circumstances. At compile-time, the compiler is 100% certain that this function can only be called by other code in the file(s) it is currently compiling. Function foo cannot be called by anything else, ever, given the definition of what it means to be static. Because the compiler knows all of the callers of foo at compile time, the compiler is free to use whatever calling sequence it wants (up to and including not making a call at all, that is, inlining the code for foo into the callers of foo. As an author of assembly code, you can do this too. That is, you can implement a "private agreement" between two or more routines, as long as that agreement doesn't interfere with or violate the expectations of standards-conforming software. Mostly for fun, but also as a quick verification that you understood the ABI right. Tested in Ubuntu 18.10, GCC 8.2.0. Not the answer you're looking for? Browse other questions tagged linux assembly x86-64 abi or ask your own question. Is function call messing with other registers than %rax? Decrementing rcx in assembly yielding 0x00007fff988c63c7 instead of 1 in x86 assembly? What Is Tail Call Optimization? Where is the x86-64 System V ABI documented? How do I link a C++ subroutine to an x86 assembly program? Why does Windows64 use a different calling convention from all other OSes on x86-64? How to preserve argument/parameter registers under x86-64? What registers need preserved in Microsoft x86-64 Calling convention? C++ on x86-64: when are structs/classes passed and returned in registers? What happens if you use the 32-bit int 0x80 Linux ABI in 64-bit code? At what position in the stack should the preserved registers be saved when calling a function?